The Center recently received a NASA grant to develop a high-capability Planetary Advanced Radio Sounder (PARS). This high-power, high-data rate remote-sensing instrument will provide critical and diverse measurements necessary for detection of subsurface oceans and for characterization of ionospheres of moons, magnetosphere-moon interactions, and permanent or induced magnetic fields for missions to icy moons and other bodies in the solar system. This information is critical to determining if life is possible on moons of this type. 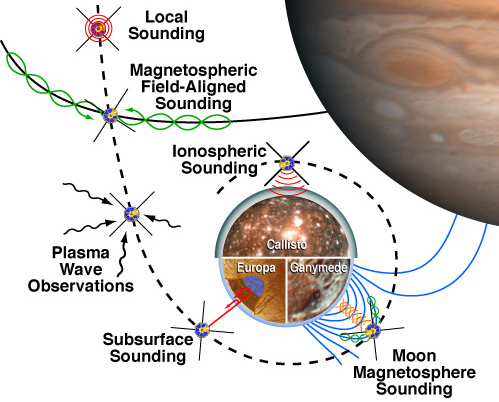 The first opportunity to fly the PARS instrument is on the nuclear electric power and propulsion (NEPP) enabled Jupiter Icy Moons Orbiter (JIMO) mission whose scientific objectives include determining the presence and distribution of subsurface water in the icy moons and determining the nature of magnetosphere-moon interactions [Science Forum, 2003]. The following five fundamental scientific measurements can be made by PARS to substantially contribute to the scientific objectives of SSE Prometheus class missions (see Figure 1.1). •Local sounding, to determine the magnetic field strength and the electron density at the spacecraft. Fig. 1.1 PARS will make five critical measurements for JIMO and other NEPP enabled missions. •Passive electric field observations, to measure natural electromagnetic and electrostatic emissions. 5) larger operating frequency range to cover the broad sounding frequencies and all scientifically significant portions of the radio spectrum. To guide instrument design and development, we will perform numerical modeling of radio signal reflections from Jovian icy moon ionospheres, magnetospheres, surfaces and subsurface layers. To achieve the above measurement objectives, the instrument design will take advantage of the three NEPP enabled capabilities of the JIMO mission, specifically high power, high data rate, and high duty cycles.